Facebook‘s so-called “walled garden” is about to get a lot more like the blood-brain barrier, which is good news for people who want Facebook to become their all-in-one networking utility. And the privacy concerns some are immediately raising seem to be reflexive rather than reflective. In biology, the blood-brain barrier protects the brain from chemicals in the bloodstream. Likewise, Facebook puts up a barrier to the wider internet that prevents spam messages from getting through. Facebook announced today that extremely limited versions of its users’ profiles will be available for viewing through Google, Yahoo and other search engines. Techcrunch rightly notes the grave implications for some start-ups looking to fill the people search niche. An SEO blog also notes benefits for companies that want to be found online (and therefore for their customers, who are looking for them). Other reasonable analyses are here, here and here. Many of the objections raised today are the standard response of those who see a privacy threat in every aggregation of online data, or worse yet, a conspiracy. Like this laughable Flash-in-the-pan that tries to connect Facebook’s Terms of Service (in which users are saying, in legalese, that they have the right to upload whatever they put on Facebook and that Facebook has the right to display it on the internet) to everything from global climate change to the JFK assassination. Hard to see a big threat there. 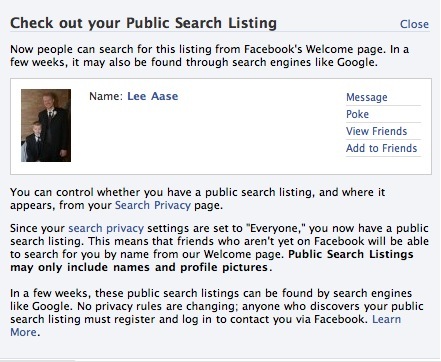 And those with phobias about privacy implications can opt out, so no one outside Facebook can search for them. For the fearless, this is a great development. I will be able to do a Google search for people I know and find out whether they are in Facebook, so I can send them a message or a friend request. But because people who aren’t Facebook members can’t send a message without joining, we don’t have to worry about this opening the spam floodgates. It will, however, encourage lots more people to join Facebook, as they see Facebook listings for people they know showing up high in the Google results, and as they discover they need to be members to send a message to them. Facebook has been growing at over a million users a week already; this will only accelerate what Newsweek called its “astonishing” growth. That’s a mighty reasonable analysis yourself, Lee! Great stuff.